Christian Siriano has captured our attention with the drama of his designs and his inordinate creativity. In this Fall Winter 2016 Collection he dazzled us with a the recently popular big chunky knits, but here we see them for Fashion instead of Home Decor. 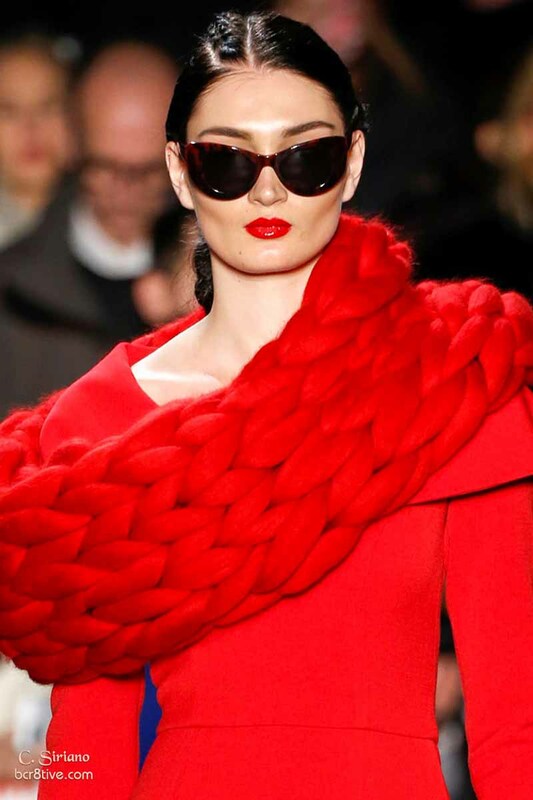 Chunky knit scarves are dynamic accessories and pair with sumptuous cashmere, dramatically original knitted tops, completely embroidered styles and chic and tapered sweater dresses. While this cozy but chic knit theme runs throughout the ensemble, Christian amplifies it all with utter originality as he emulates the knits as a pattern on draped cocktail dresses and fluid evening wear with fluttery ruffles. He also combines classic tailored looks with details of unique cuts, peek a boo shoulders, one sleeve options, and suit coats that taper and skim the floor like evening gowns. These clever details are amplified when they’re used on the flowing, flouncy and body skimming evening gowns and cocktail party dresses. Ruffles are used in a myriad of ways; as small appliques, as large petal-like layers, and in the off the shoulder styles that make a big sensual statement in knits or chiffon. The evening wear is classic but dramatic and highly memorable. He kicks all of the the styles up a notch with snake skin patterned thigh high boots, knit or ruffled shoes and cat-eye sunglasses. One Response to "Christian Siriano Fall 2016"
Christian is an amazing designer and this is a great collection.